The Wii is, or was, a popular platform for puzzle games. In part, the controllers allow for a different experience that can tie into the genre well, but the system is also a big hit with the casual audience who usually enjoy them a lot. 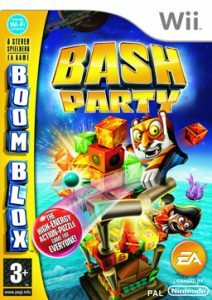 Boom Blox Bash Party seems to combine them both, as a game where you bash blocks into each other to solve these problems. With a puzzle game like this, it’s the variation that can matter a lot. Games like Lumines can draw on escalation as the game goes on, but Chime‘s time limit creates pressure while something like Planet Puzzle League can start to falter a bit after a while. The difficulty goes up but it doesn’t necessarily work as well in a long term set up. Boom Blox Bash Party goes for variety. It all revolves around the physics systems, throwing things against blocks that fall over. The blocks behave in different ways – some exploding on impact, others falling with different weights, and some disappearing match three style. When they fall on the floor or other things happen, they give you points, but with the different types of blocks and levels, they manage to create different distinct game modes. Toppling, explosions and other projectiles account for a part of that as well. It all ties into the Wii controls as well, the motion controls helping the system feel really nice. And if that’s not enough, you can make your own levels. You can’t share them online anymore, but there’s a lot of options that would have created more of this variety. You need to unlock a bunch of features one by one, but it’s a nice extra feature. After all, Mario Maker was based on that principle alone. There’s not much of a story to the game – you’re going through a circus and seeing different performers do their thing inside. It doesn’t really make that much sense, but the block creatures are nice touches and it’s nice to see them interact with each other and comment on your performance. It’s a cute style, not too complex, but it adds a lot of personality to the game. Boom Blox Bash Party is a puzzle game that does more with its concepts than a lot of others and has a nice fun setting around it. I really enjoyed playing it and while it gets more difficult soon enough, there’s so much to do in the game that it never really matters much. I was incredibly impressed by the first Silent Hill game. It had its control issues and its age showed, but the setting was good and tense and the puzzles worked quite well. We’ve also seen Fatal Frame in a similar setting, but now we’re returning to the titular town of Silent Hill to see what’s happening there. 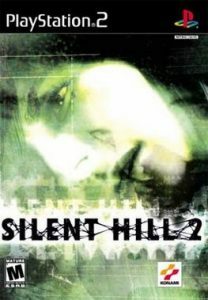 Silent Hill 2 was a very creepy game. Knowing the weird creatures that run around in the first game, the fact that the game starts with a walk down a misty lane when you have no protections feels scary. From there you do get a weapon, but fighting enemies never seems like the focus – I put the combat difficulty to easy, so that helped, but I felt it helped the atmosphere. It’s not about the action, instead I got to explore this creepy world and see what was going on. It starts off slowly, building up an abandoned appartment building with a big scary boss at the end that you can only run from, never defeat. It builds from there, with a section in a hospital having been the most effective so far. The mysterious antagonist is around there a few times, but rather than just chasing you, he seems to get to others. The abandoned hospital, with its many locked doors and areas, have padded cells, mortuaries and other places that make you uncomfortable. It’s hard to show that through the blog, but the tension is all there. That’s combined with a game that plays better. The controls are more manageable, making my way through was a lot better. Again, I really got into the game, and the relative ease of play helped with that. The game felt set up to work for me, and that felt good. Not only does Silent Hill 2 succeed at creating a creepy world, the puzzles are varied enough to keep me interested and I was glad I could tone down combat here. My nerves even held steady enough through out so I wanted to keep playing, the horror was tuned just right for that. It’s superior to the Resident Evil series and I’m looking forward to returning to this world in the future. Sometimes, you know, I’m just checking boxes. 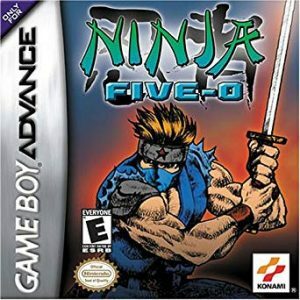 Ninja Five-O is another 2D action platformer, although released a decade or two after they were popular. Still have to play it, we’ll see what’s in there. After games like Bionic Commando Rearmed and Contra III and their arcade predecessors, I’ve started to develop some fatigue with these action platformers. There’s not technically a focus on platforming, but there were some jumping challenges and some of it felt like it stopped me (although I might be wrong on some of them). Most of the time, it’s more of a run and gun thing, fighting a lot of tough enemies and trying to save hostages. That’s more difficult than it sounds, as you need to shoot at the right time and the timing gets difficult. After the first level, the levels get large, spread out over several rooms (which don’t all matter at my easier difficulties). You’re searching for hostages to try to free, for keys to open doors, and passages through the level. I mostly got turned around later on, missing out on all the different ways to traverse. This game is fine, I suppose. It does the job. It looks fine for a Gameboy game. I see the point. I just don’t see what’s outstanding about it here, which makes it difficult to enjoy – so yeah, it’s not my thing. An APB or All Points Bulletin is a message send to cops and law enforcement officials usually to make them aware of criminals to look out for. It’s a common enough term that finding out about the game isn’t that easy. You’re a cop, sure, but the game resembles Police Quest‘s driving more than it does an investigation to find wanted criminals. 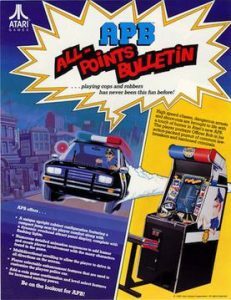 The basic gameplay of A.P.B. has you driving along a top down road (think Spy Hunter, but with a graphical upgrade and a lot more less relevant traffic). Your first duty is to arrest certain people breaking the law through littering and otherwise – you turn on your siren, have them pull over and arrest them. Or rather, if you play as I did, you kept your siren on and kept ramming into cars that were suspicious until you got to arrest them. It’s not the only way to arrest or be helpful – you also need to stop to help people with broken cars and to stop hitchhikers, which don’t need sirens but do require you to be careful – and have a bunch of bonuses to pick up to, for example, give you extra time. Each level also gives you a bunch of requirements which you need to do while looping around the map. This starts off with just asking for a certain number of arrests, but goes up. They help you avoid demerits, for not doing your job, driving dangerously and doing other things you shouldn’t do. It’s a bunch of rules and while they make sense, they drive home the idea that being a cop might not make for the most fun game all the time. When you can get some good chases in, though, the game really works. Chasing after them, stopping them, when you get the controls right becomes a lot of fun. It’s really a shame, almost, that the arcade elements require restrictions that make the game less fun. I only rarely play the old RPGs, even though I enjoy digging into that history sometimes. 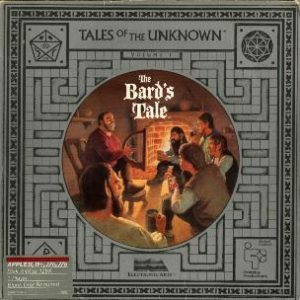 I’ve played Eye of the Beholder and Ultima VII fairly recently and Bard’s Tale fits the dungeon crawler mode of the former. I’ve heard the stories (and know I need to take a bard with me to actually finish the game) and seen how the series has recently been revived, but I’ve been a bit scared to jump into it after that. Now I’m going to try to see how the game actually works and whether I can get into this one. Bard’s Tale is quite a tough game from the start – probably tougher at the start than it would be later. While you’re navigating the 3D town, things go on in semi-real time and you can get attacked as you walk around. The random encounters, at the very least, have a chance of killing you, and they can jump you before you’ve even had a chance to get yourself equipped. That could be a party killer on its own and it made me struggle. At least the default party comes pre-equipped (and with a bard) so it’s easier to start off and get something done. What that was, was grinding on enemies walking down the street to get some extra gold (you need to bribe a bartender to get to the first dungeon and need to be able to pay for healing). The system isn’t too difficult. The front row can attack, the back row only with spells or ranged items. Dying means someone else steps forward (and resurrecting is extremely expensive early on, so not a great option anyway) but you usually just want to attack with a few. It’s all from the manual and, of course, FAQs, but it was a decent system, much like you’d expect from the era. It takes time to know the controls – the UI isn’t great – but I managed to figured it out after a while. While the systems haven’t been too complicated yet – with some walkthrough help on what does what – the world itself is daunting. It all seems to take place in a single city, which is giant and sprawling – again, I had to have a map to follow where I needed to go, as the graphics made it easy to get lost and the battles can make you get turned around. Without a map, finding your way back is impossible. The dungeons are as big, but as they’re more open they feel a bit easier to explore. They’re still pretty big though, and I really could have gotten lost later. In the end the Bard’s Tale hit the right spots: a big world with some good RPG elements. It’s as primitive as its age suggests, but it feels like it’s a step up from what came before and I can see how it might have influenced later games – this style stayed big for a long time. There’s a remake coming up and I think it’s time to try that, to experience the same feel but in a better UI. It sounds like a Molyneux-like pitch, a game where you start off as a bacteria-like organism, evolve and grow a civilization until you reach space. It was, however, proposed by the other sim genre great, Will Wright from SimCity fame, and other games like it. It’s a promise nothing can keep up with, but I’m still looking forward to trying it and seeing how it pulls it off – after all, it hits all of my buttons, and at the time the buzz was big enough. The best way to look at Spore is that we’re playing five separate mini games that link to each other. You start with the cellular stage, a version of flOw where you eat creatures, gather their DNA and create your basic creature – including deciding whether you become a vegetarian or carnivore. You take that basic form with you to the next stage, the creature stage, where you ally or defeat other species and set up your own tribe that way. It’s a stage that takes a while, because the power curve isn’t that smooth – I certainly had an hour or two of struggling more than we’d need. The tribal stage that follows is even more annoying – you have to bribe or conquer other tribes – but the bribe option was easy enough that it felt a bit exploitable. It was a road bump, again, with the fourth stage feeling more interesting. At that point, you enter the Civilization stage, as your tribe is more established, which is a far simpler version of the namesake. You set up cities and start mining funds as you take over others one city at a time. You can do it through military, religion or trade, the former two acting something similarly with some different units and the last mostly requiring a lot of gold investment. It’s decently fun and while at times clunky it was probably my favourite of the phases. The final stage, into space, broke on my game… and I couldn’t really be bothered to replay the amount I’d need to. From what did work, there’s a large chunk of game here still, with a lot of upgrades and technologies, a decent trade system and more to explore. It’s expansive, but it sounds like there’s not necessarily much of an end to that either. The nice thing about this is the continuity – your creatures get taken along between the stages and each bit of design you do carries over to the next stage. This lets you make not just your own unique creatures, which is cool enough, but also clothing designs, buildings, vehicles and so on. It’s nice to give it a particular style and even without too much work gives you something that looks decent. Obviously, modders took this much further, but even the base game gives you loads of options. How do I judge this? The individual minigames are from meh to decent. The creature customization is pretty engaging and, in my case, can lead to some horrifying results, and the way it carries over between these is quite nice. 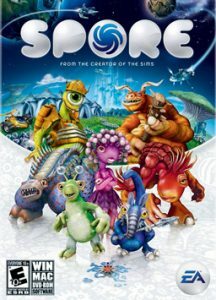 It means the sum is better than its parts and Spore is still enjoyable, just perhaps not as much as the promise initially implied. Sometimes, you realise you just have to play these light gun games, and at that point you realise you’ve got to compromise. 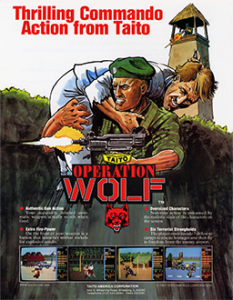 I’m about to tackle Operation Wolf, which is one of those, and so I’ll be playing with mouse control. I guess I’ll have an easier time of it, but with the normal difficulty of these games, I don’t mind that too much. I’ll admit that, yeah, I probably had an easier game here than some other lightgun games. I doubt I would have gotten anywhere without it, so I don’t mind it – the game felt right in terms of difficulty this time. I managed to make my first run through the levels – with some deaths, but nothing too difficult – to get to the far harder second round, so that helped a lot. For the most part this plays as a decent shooter, enemies pop up that you have to shoot while not shooting the occasional friendly. There’s ammo and such to pick up in the same way, there are tanks to avoid, limited ammo (and if you run out that’s a game over) and other things like it. There are some nice differences in how the stages are laid out, but mostly they play similarly. That was different, though. Out of the six stages, the Japanese version had four available at the start (while the worldwide version forces you to play in order) and finishing each gave you a boost – one giving you access to further levels, others increase your ammo or take away enemies. This still happens in the international version, but you can’t really tell since there’s no choice involved. It’s a nice mechanic and would have helped the game. Operation Wolf was a pleasant surprise. It was originally down as a game I was least looking forward to playing, but it turned out to be a fun shooter, with everything that I could adjust. Not as bad as I thought – I guess I should be playing more rails shooters like this, because they usually work for me! The Ultima series of games rather intimidates me. The first game in the series was still fairly primitive, while as an MMO Ultima Online is more of an outlier than you’d expect from the genre. However, that game also shows that the series becomes pretty simulationist, focused (at least for some time) on a world that exists on its own that you exist in. I don’t think it goes too far when I say that it influences the development of open world games like those of the Elder Scrolls series. So having recently read that really, Ultima VII almost becomes an adventure game with a combat engine that may not be as good, I’m curious how that translates. Time to suit up and become virtuous as the Avatar. 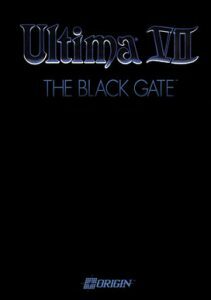 Ultima VII was released in two parts. To keep things focused, I mostly played the first part, although I tried the second part and saw the way it reest your stats and inventory – something that I thought was done quite well in the end. Unlike most RPGs, Ultima VII doesn’t have a lot of combat, and what it has isn’t that inspiring. You click, I’m sure there’s some spell casting I could do at some point, but I barely remember it. What I remember is going all around town, trying to find a murderer and seeing what else is going on in this town. People live their lives, doing their things and moving around their towns. They feel fairly realistic, or as much as they can be, and the game focuses on keeping the interactions possible. One feature that’s important in both genres is the inventory. And man, it feels clunky. It’s bags in bags, your inventory literally starting in your paper doll, and things can overlap and get lost. Realistic, perhaps, but normally I interact with my inventory in 3D and have a better idea of what’s where. It feels like it’s trying to be too clever, but gets in your way instead. One of the big features of this era of Ultima games is that it’s about the virtues, showing that you’re a good person and the right hero. Not much of that came across here so far, but as a lot of that is usually hidden anyway, I wonder how badly I messed up so far. It still is enough to make me move careful around the world, pretty much the result you want. A bunch of the mechanics in Ultima VII are pretty iffy, with the inventory being especially awkward. Even the fan based engine updates didn’t fix much of that for me, although the world became a lot easier to explore. It feels like there’s much more hidden in there. However, it feels like it would have been a better adventure game, though, with the combat segements feeling like they’re there because they have to be, rather than because they fit into the game. I’ve been creating a bit of my buffer for these write ups, which has the handy side effects that I can use Christmas to play some longer games, rather than using it to catch up and get ahead. I’m still not quite on the hundred per year expectation, but by slowing down a bit I can at least take the chance to enjoy the games a bit more. While Double Fine Entertainment has had quite a varied output, their first game is probably one of their best known ones. Psychonauts is a 3D platformer with a heavier story focus – of, I believe, going inside the brains of other people to sort out their problems. If it’s like others, there are plenty of additional things to find, but I also hope we get decent solutions to the control issues earlier platformers had. There is something charming about the story telling in Psychonauts. While Raz, our protagonist, takes his position as future hero serious from the start, the summer camp setting filled with odd, over the top characters gives a more childlike look at what become quite heavy themes as we look at the inner life of these characters. Psychonauts, after all, are humans with psychic powers that allow them to get into others minds, see their fears and issues, and help you work through them. Most important, you start getting insights into Raz’s own mind, which you only get to explore a step at a time, figuring out what’s locked away. The minds, first of all, are pretty cool environments. They’re the levels in the game – fairly linear, with a set of collectibles that are in each level and more specific enemies. The levels are all quite different and distinctive – the first is a war-based theme with trenches and other machines of war, while later a teacher’s mind turns out to be a cube with a further organised set up and more mechanical elements. Your own mind? A dark cave, obviously. On the other hand, the levels are connected in a large open world – where most of your powers still work thanks to plot logic, creating a weird and (in my mind) very big camp to go through, in an area that has some weird other experiments going on. There’s also the obligatory store with powerups to buy, although I think that’s being kept until later to really kick off – it all seemed quite unaffordable to me. 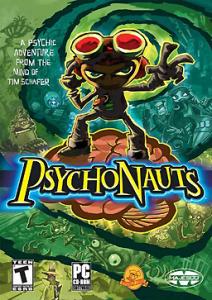 Psychonauts is a good 3D platformer, with controls that work a lot better than they did a hardware generation earlier when it was still working itself out. It’s quite straight forward there anyway, but it also adds in a charming plot that explains a lot of your weird abilities and takes you into far stranger worlds – while justifying that existence. It’s not just charming, but also a great game to play and I’m looking forward to the sequel. I don’t get wrestling. I’m not even talking about fakeness or performances, I don’t really get the appeal of watching people fight. I think I struggled with that in the previous WWE game we discussed. 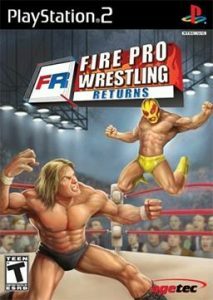 Fire Pro Wrestling Returns at least avoids the WWE side of things, drawing from other international leagues that I guess seem to take themselves more seriously. It also looks like it avoids the standard 3D side perspective, so at least we’ll be playing something new. There’s a lot that feels different here from other fighting games. The isometric perspective is a big change, almost immediately making it seem more strategic. At the same time, I don’t think that’s the real result. There are very few indicators as to what’s going on during the fight. As the game is mostly based around your fighter’s exhaustion, that’s what you need to check, but only some of your animations really indicate it – like when you get up after falling. It means that you’re doing a lot on gut feel, which doesn’t always work, and which contrasts with games where I feel like I have more of a grip on the mechanics and controls. I suspect that the real reason for the perspective is for the game’s stand out aspect: its customization.The default roster is immense, with a triple digit number of wrestlers based on a template, a few customization options and some groups of fighting styles. The system gives a lot of variety, but it feels like the entire game doesn’t really allow for that much individuality, they’re all the same fighters at their basic. There’s still a fair amount of custom fighting styles, but I think that at the same time, I didn’t get enough of an idea of what the real differences were. There areloads of modes to play through as well, with different tournament types and setups. It’s actually a bit of a dredge to set up in the first place, but for the most part it feels impressive enough. I guess it’s hard for me to say for sure, but this feels like a game with a bunch of options, not all of which necessarily lead to a difference in the game that really matters. It’s nice to get something different out of a wrestling game, but arguably it doesn’t give me enough to work with and learn them.